The new year finds me in a rich place. Both writing and painting passion-ate me! I’m surprised by how blogging motivates me to write, and of course to illustrate my words with my own artwork, painted or photographed, FINALLY manifesting my childhood dream of being an artist in the world. Umami!!! It’s been a long detour to arrive at this focus of being. Or maybe it’s not a detour at all but the journey of this one particular soul through this experience of living in this particular creative bodymind. Each day, each minute, adds to the texture of how I respond to life. My recent invitation to join a gallery named Front Street offers a great example. A cooperative, the artists, who number close to 25, have been together for about five years I think. But they’re new to their current location, having moved from another town in March 2010. They seem exhilarated by their new digs and I’m ever so glad to have come on board at this time of blossoming for everyone. To my delight – and challenge – they expected me to hang an exhibit one week after they accepted my application. Whoooops. That sent me scrambling to find my old artwork, not yet unwrapped and sorted since my move from Montana. 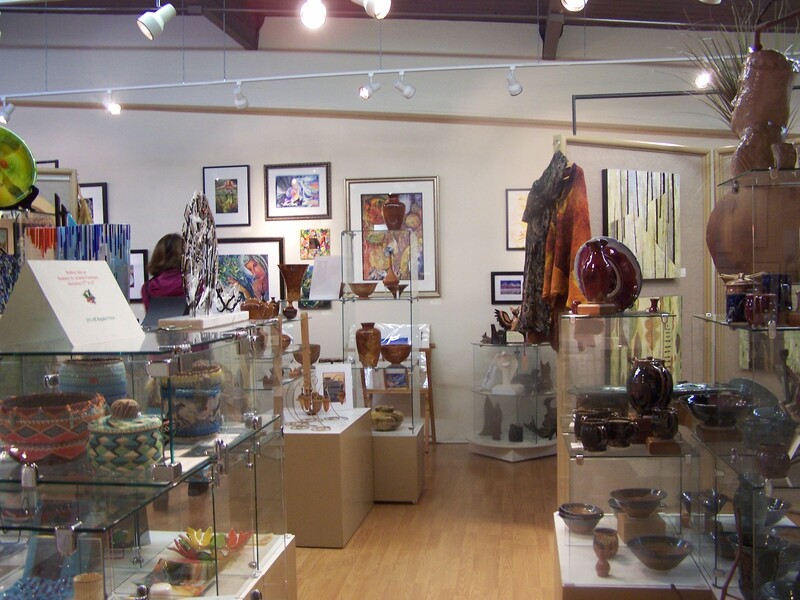 They also encourage monthly exhibit changes and producing at least two new works a month. Occasionally they even have theme shows. February, for instance, is black and white with a touch of red. I’m off and running on that concept already, but more on that in another post. I’ve been both focused and galvanized. Organizing my materials, kicking my granddaughters off my art table and out of my supplies ( I gave them their own “professional” artist’s kit for Christmas! ), purchasing some new boards on which to continue my watercolor experiments begun in the Fall, inventorying, re-printing business cards, note cards and prints to account for the changes in my contact info and working focus, tending to myriad details, eeeeeegad, it’s been a swirl. I almost forgot the holidays and as you have noticed, I haven’t been blogging as frequently. So I gathered together mostly old work – images I’d forgotten about – and made it to the wall on change-over day. I notice immediately everyone’s helpfulness. Hammers and sticky stuff for hanging labels are hand delivered, in fact the labels are actually made FOR me by someone else. Now that’s professional, isn’t it??? There is an elegant uniformity about the displays that I appreciate – even the note cards are all displayed in the same rack. When something is hung off kilter, people with kindness point it out and offer to help rearrange. People notice when lighting is poor – not just on their own work – and adjust it! So in the spirit of making two new pieces a month, for January’s change-over day on the 4th I managed to finish two originals and embellished a print in fanciful ways. BUT the most exciting decision was to repaint an old image. This has been a wonderful testimonial to my development as an artist and the fact that there are no detours in life. 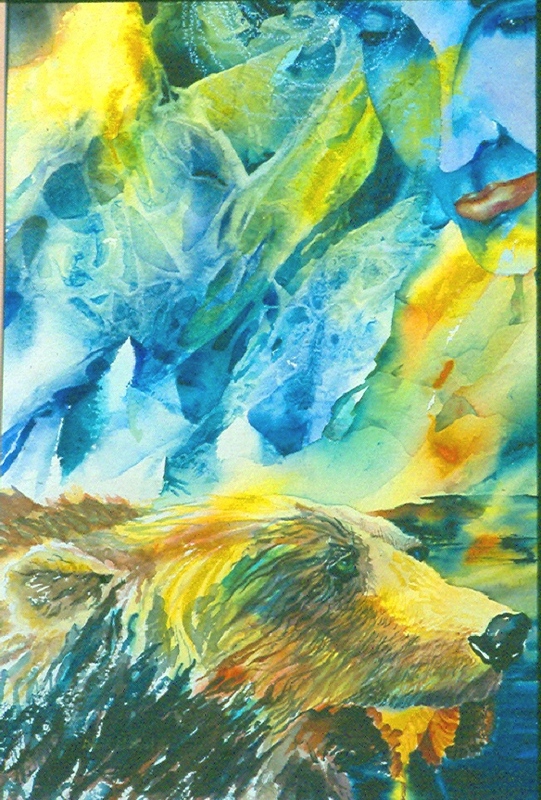 Back in 1997 I watercolored three images all based on the same black and white photo lent to me by a friend of a great northern bear with a newly snagged salmon in its mouth . Two sold immediately. The third lingered in my stash. The frame had been nicked over time, so when I found it a few weeks ago, I immediately knew I’d take it all apart so I could refurbish the frame. 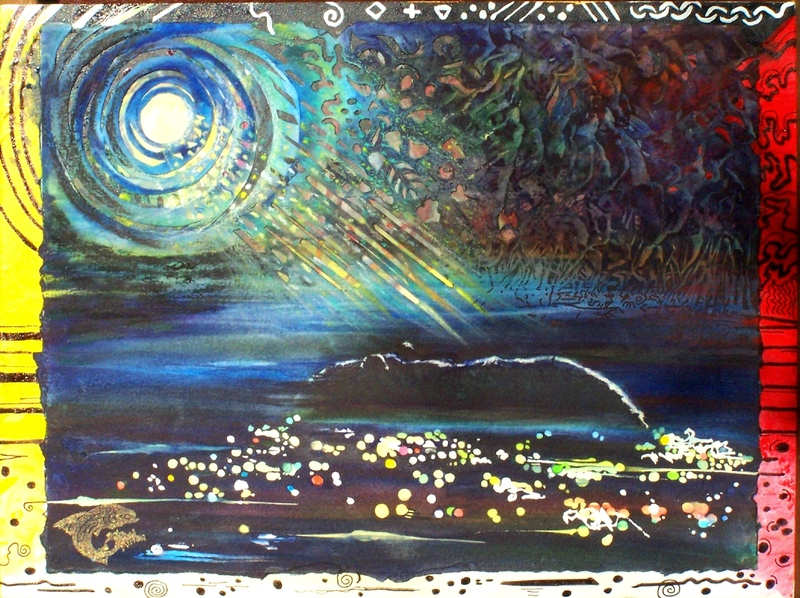 Since the painting had never sold, I concluded the image must be off. I decided to apply my thirteen years of further experience and multi-media glamor to re-paint it. 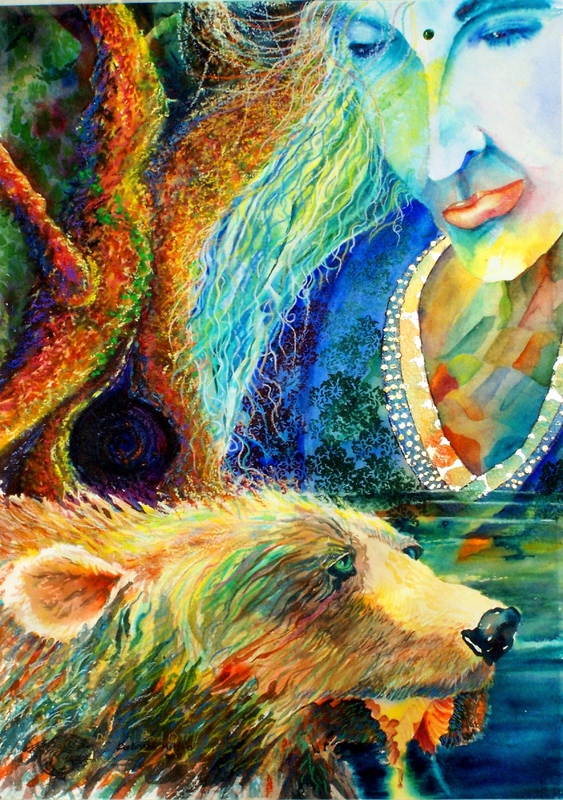 So many experiences have changed me in those years that I found the image wasn’t meant to represent a kodiak, or northern grizzly bear ‘midst glaciers and artic cold, but the rainforest and the spirit bear. I love the metamorphosis and the endless possibilities when I give myself over to destroying one thing in order to create another, when I recognize there are no mistakes and no detours. Everything depends on everything else; trials, tribulations and failings are the bedrock of fulfillment. Ahhh yes, I like that. This entry was posted in wonder and tagged perfection, surprise, threads. Bookmark the permalink. WOW, Deborah! It’s wonderful to read the enthusiastic joy in your writings! You are, of course, of COURSE, an artist in the world. I’ve told you that. Every day, I walk down my hallway, past your moon art, into my dining room, where hangs the wonderful “She Walks in Power” lion. Ahhhh, yes, I think frequent thoughts of you, I miss you & look forward to our next time together! ( snowshoe maybe? ) soon. Sending love and gratitude to you… for all that you are and all that I am because of you in my life. If you want to paint with watercolors on canvas, try painting the fabric with three coats of WAG – white absorbent ground – first. Makes the canvas behave a little bit more like paper but the effects are wondrous that you can achieve by lifting pigment – ever so much more forgiving than watercolor on paper. Enjoy enjoy. AND maybe you are already doing that…I offer this just in case…and I’ll send you some if you can’t get it right now. Let me know. 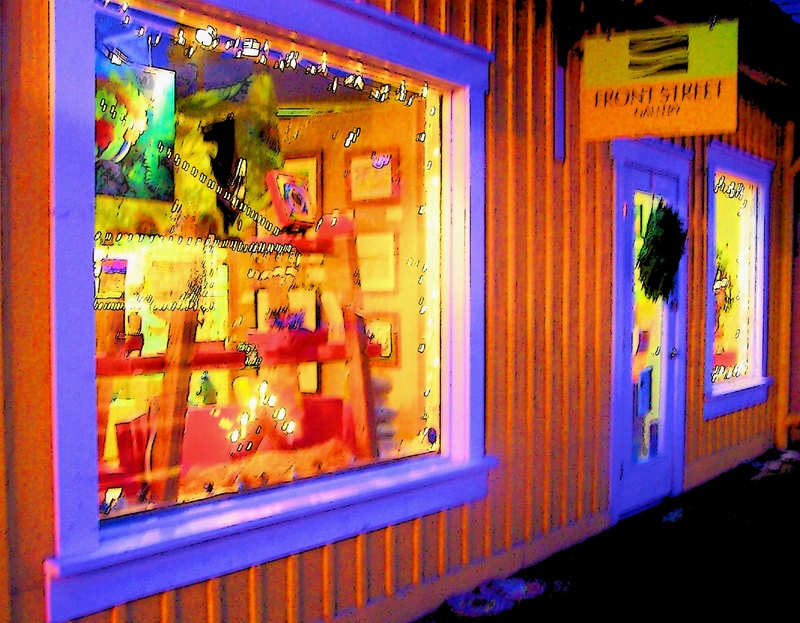 Your night time photo exposes the magical mystical aura of Front Street’s portal into the world of art! Very cool! Thanks Julia. I loved tweaking a blurry ( no tripod ) photo to make it fun and expressive. I also loved meeting Jackie and talking about us three hiking. Hurray. Thanks for input and suggestion.. I will look and see… think I might have the white absorbent ground in my art room downstairs in basement. I have avoided it since there is no heat there and been painting upstairs… in dinning room. 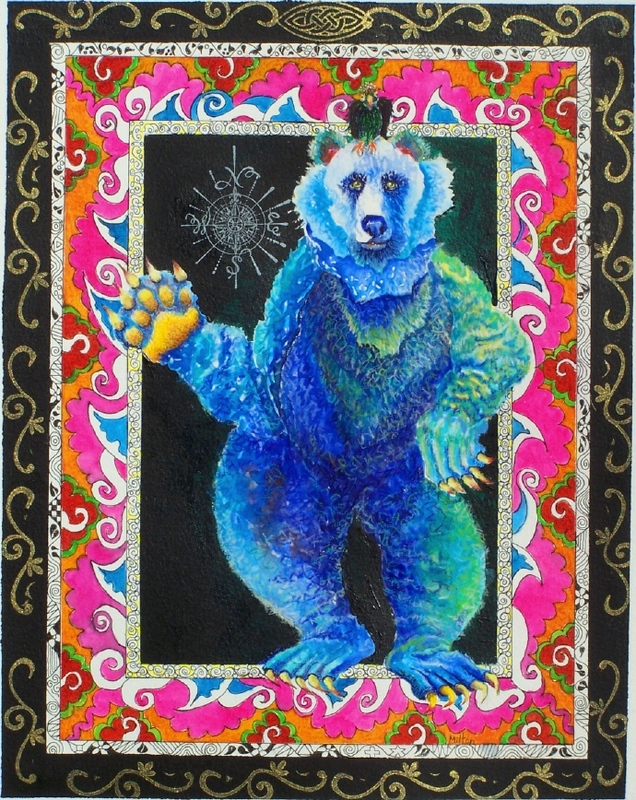 The pictures of the’ metamorphosis bear picture’ is such a potent visual image of the contrast between being awake and asleep……..the intensity, depth, and richness of what awaits me if I have the courage the continue forward remembering the path spirals. No detours. Our ancestors understood that when a cycle has ended there was a birth on the way……they would take apart a temple (energy center) and rebuild it in the same spot century after century………always building on the old to make the new. Your pictures ignite an excitement in my soul …….. A birth is coming…..
thaaaannnnk you Cinda. As always your comments bring me to yet another and deeper level of appreciation for our winding paths of living on this amazing planet and the inescapable connection between dying and “re-borning”. Thank you so much, Kate. I’ve been thinking of you a lot this morning because of your tender story of yesterday. The myriad blessings all around us all the time even when we’re feeling a bit low. Maybe especially when we’re feeling a bit low, those everyday miracles of love and life mean even more. I’m quite blown open and over by the advent of this gallery community in my life. And I’m so happy to have found this blogging world with YOU in it! Watch out 2011 ’cause we’re dancing on the big pond between our countries.